Dr Eva Huang is a cross disciplinary researcher, her work crosses law, economics, social policy and technological innovations. Eva is also an active research collaborator. Eva has close collaborative relationships with leading institutions in her fields of research. She is a Research Affiliate of the Cambridge Centre for Alternative Finance based at the University of Cambridge Judge Business School. Eva has a long standing relationship with Xiamen University, a 985 project University and an acknowledged leader in tax research and teaching in China. 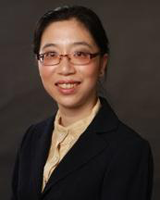 She is an Adjunct Associate Professor of the Department of Public Economics of Xiamen University. She is also an Adjunct Researcher of the Center for International Tax Law and Comparative Taxation of Xiamen University. Eva mentors and collaborates actively with her research students, including two PhD students. Eva is the founding and current joint editor of the Journal of Chinese Tax and Policy, the first English language journal with an exclusive focus on taxation policies and laws in China. She is also the convener of the International Conference of Chinese Tax and Policy which is the annual conference of the Journal. Eva is on the Chinese State Administration of Taxation's list of foreign experts, qualified to advice on tax reform issues. She also worked for the Australian Treasury as a policy analyst, focusing on the tax policy of non-profit organisations. She is a NAATI accredited professional translator with extensive experience, specialising in financial, technical and legal material. Eva is also a registered tax agent, and has provided advice to tax and business advisors in regards to cross-border transactions involving China. Eva’s research interests are comparative fiscal policy, comparative taxation law, and regulation and compliance relating to e-commerce and Fintech, cryptocurrencies and blockchain technology. The jurisdictions Eva researches in are China, the UK, Australia and New Zealand. Her current research focuses on the impact of the development of e-commerce and technology on regulatory and compliance activities, especially in cross-border taxation, payments and capital raising. Huang Y, and Nan X (2019) Contributing to the Individual Income Tax Reform Debate in China: Is Family Based Filing of Individual Income Tax Returns a Feasible Solution to the Social Problems arising from the Increasing Family Income Inequality in China? Journal of Chinese Tax and Policy, In Press. Yang B, and Huang Y (2019) Taxation in China (forthcoming); Thomson Reuters, Sydney, Australia. Ziegler T, Suresh K, Johanson D, Zhang B, Shenglin B, Luo D, Wang Z, Wang W, Chen H, Alam N, Huang Y, and et al (2018) 3rd Asia Pacific Region Alternative Finance Industry Report; Cambridge Centre for Alternative Finance, Cambridge, 1-111. Huang Y, and Bai Z (2017) Digital Finance in China: The Internet Era Digital Disruption: Impact on Business Models, Regulation & Financial Crime; Australian Scholarly Publishing, Mebourne, 69-81. Garvey K, Zhang B, Ralston D, Ying K, Maddock R, Chen H, Buckingham E, Katiforis Y, Deer L, Ziegler T, Huang Y, and et al (2017) Cultivating Growth: The 2nd Asia Pacific Region Alternative Finance Industry Report; Cambridge Centre for Alternative Finance, Cambridge, 3-101. Huang Y, and Bai Z (2016) Third Party Recovery of Taxes International Taxation in China, 3, 80-81. Huang Y, Wu Z, and Bai Z (2016) The Australian and New Zealand's VAT Model on Financial Service Industry: an Introduction on Experience to China Journal of Chinese Tax and Policy, 4 (2), 120-134. Huang Y, and Underwood N (2014) The Impact of Tax Holidays on Renewable Energy Project Development in China: A cost benefit analysis Journal of Chinese Tax and Policy, 3 (2), 270-285. Huang Y (2012) Editorial Journal of Chinese Tax and Policy, 2 (1), 1-1. Huang Y (2012) Editorial Journal of Chinese Tax and Policy, 2 (2), 29-29. Huang Y (2012) Book Review: "Taxpayer Rights to Compensation for Tax Office Mistakes" by Bevacqua Australasian Tax Teachers' Association ATTA News . Huang Y, and Ting A (2011) Editorial Journal of Chinese Tax and Policy, 1 (1), 8-8. Yang B, and Huang Y (2011) Characteristics of the Chinese Tax System and its Cultural Underpinnings: a Comparison with the West Journal of Chinese Tax and Policy, 1 (1), 13-33. Huang Y (2010) Taxing Higher Education - HECS/Fee-HECS-HELP Repayments as a Tax and its Effects on the Progressive Tax Rate International Journal of Accounting Information Science and Leadership, 3 (6), 12-22. Huang Y (2010) Identifying Hybrids in Australia: Comparing the TOFA Debt and Equity Rules and AASB 132 for a Definition of Shareholding Journal of Law and Financial Management, 9 (1), 2-13. Huang Y (2009) Cross-Regulatory Arbitrage: An Illustration from Leasing Journal of Law and Financial Management, 8 (1), 8-13. Huang Y (2009) Book Review: "Australian Tax Analysis Cases, Commentary, Commercial Applications and Questions" by Coleman, Hart, Bondfield, MacKerchar, McLaren, Sadiq and Ting, 7th edition Australasian Tax Teachers' Association ATTA News July. Huang Y (2009) Book Review: "Tax Questions and Answers" by Fisher & Hodgson Australasian Tax Teachers' Association ATTA News June. Huang E (2007) Should a form of client legal privilege be extended to clients of tax advisers other than lawyers? Tax Specialist, 11 (2), 143-153. Sohu, Caijing, Sina, China Daily, People’s Daily, China News, Xinhua and Caixin reported on a study by the Business School into the growth of alternative finance in the Asia Pacific Region. The Australian Financial Review, The Australian, Business Insider, Banking Day, AB + F and Financial Standard reported on the Business School’s research in collaboration with KPMG on alternative finance in the Asia-Pacific region.